JewishWorldReview.com | In our house, baked custard wasn't reserved just for the holidays. My mom would often make it after getting out of the bath late at night, "Murder She Wrote" playing from our little counter-top television. I remember smelling the warmly spiced vanilla aroma coming from the kitchen and knowing that the following day was going to be a good one. In college, I really missed my mom's custard and called to ask if she could email me the recipe. In the mail five days later, I received a very tattered copy of "The Fanny Farmer Cookbook" with a sticky note on the page for Baked Custards. Five ingredients, less than an hour -- could that really be it? I started making custards for myself and my roommates. During finals, they were a lifesaver late at night. Today, I do different versions of my mom's custard. Sometimes I add preserved lemons on top at the very end, other times doing an almond cardamom custard. For the holidays this year, I decided to test an Eggnog Custard using my mother's base recipe as a model, but simplifying it (not cooking the custard before it goes into the oven). The result? Still simple. Still wonderful. With a subtle eggnog flavor and a slightly boozy aftertaste. 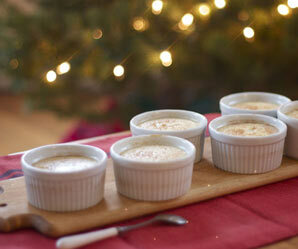 Some people dismiss baked custard because they've had tasteless, overly dense or chunky custards. This one is far from all of those things. It's surprisingly light, it's smooth, and the flavor is subtly sweet. The brandy or rum is optional, but if you're making these for adults I'd recommend it -- I used rum in mine and love the flavor it adds. You'll also want to make sure to use a whole fat eggnog. There are different versions on the market now ranging from non-fat to soy, but remember that you'd much rather have your custards set than save a few grams of fat in the long run. What makes me smile most about this custard recipe is that it's a tradition that I've made my own. And the older I get, the more I realize that's what the holidays are all about. Preheat oven to 325 F. Whisk together the eggs and sugar. Then whisk in the milk, cream, vanilla, eggnog and alcohol together until well blended but not frothy. Pour through a relatively fine sieve to remove any unnecessary clumps. Portion into 8 ramekins or one 8-inch baking dish. Grate fresh nutmeg and sprinkle on top. Place the ramekins in a roasting pan and add enough boiling water so that it comes halfway up the sides of each ramekin. A good trick for this: add the water once the roasting pan is already resting on your oven rack - that way you're not carrying around unbaked custards and sloshing water from one end of the kitchen to another. Bake for 35-40 minutes, or until custard is slightly golden on the outsides and doesn't jiggle in the center when you shimmy the pan. Remove ramekins from the roasting pan and cool on a wire rack. Serve warm or, if you want to serve them chilled, allow them to come to room temperature first, and then cover and refrigerate. They are good, if refrigerated, for 2-3 days. Serve as is (what I usually do) or with whipped cream and an extra sprinkle of nutmeg on top. © 2012, APARTMENT THERAPY.. DISTRIBUTED BY TRIBUNE MEDIA SERVICES INC.